When your annual calendar is shaped as much by Comic-Con events as it is by the seasons and holidays, it's easy to develop an internal clock. Badge sales, hotel reservations, cosplay preparation countdowns; you start to develop a rhythm as sure as the moon and tides. Then someone delays a badge sale by months and you find yourself thrown wildly off kilter. 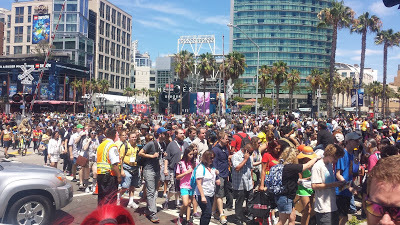 We are less than six months from San Diego Comic-Con - and none of us know yet if we're going. We don't even know when we'll know if we're going. If you've been before, you know that taking care of arrangements is an incremental, often exhausting process. There are the badge sales - two if you went the previous year; there's the initial hotel room sale and then the day the reservations open back up after a respite; there's the parking sale, there are numerous event sales and tickets for events like Conan O'Brien and Nerd HQ, and all in all you're in Comic-Con season for months before you even get close to the convention center. The Returning Reg badge sale could be announced any day. But rather than wait around for that announcement, you can take a few other actions to stake your claim. Join a buying group or at least organize with your friends. You don't have to join a ginormous group, but you should at least ensure you and your friends have a strategy as for who's buying for who. If you're utterly alone in your badge buying endeavors - it happens - then ask around. I might be able to help if you can't find someone. Scout for your safety hotel. If you don't want to do the Early Bird sale, which is truly the safest option, go ahead and gamble on the big hotel sale - but remember that last year, many of us got shut out in the cold. Looking for hotel rooms on your own can be a pain, but it does feel nice to have that reservation confirmation sitting in your inbox. Yes, this is harder (and more expensive) than it used to be. You can also ask your friends who has an aunt in San Diego you can crash with if need be, or check around on Airbnb, apps that sell off unused timeshares, and sites like Wimdu, Homeaway, Tripping, etc. Talking seriously to those people who say they want to go but haven't even created a Member ID yet. We all know these people. Most of them will never get any closer to SDCC than their sofa. But some of them just need an organized, motivated friend (that's you!) to make it happen, so check in with them one last time. If they respond with anything other than, "Sorry, I'll make my account right now" tell them they've forfeited the right to ever complain about not going. Request the vacation days off from work. I know that many of you have snow on the ground and late July seems like a distant dream. But you never know when your coworker will have some massive wedding or surgery that your boss thinks is more urgent than you going to Comic-Con, and deny your request if you wait. July 19-23: make it happen. Think about your cosplay. Lately I've been running into so many shy or self-conscious people who think their cosplay skill could never match up to the real superstars, so why bother. That's a terrible attitude! If you want to cosplay, do it. Even if you're going as an obscure character. (Someone will recognize you, I guarantee it.) Or even if you'd still like to drop 20 pounds before slithering around in spandex. Seeing all the impressive photo galleries from SDCC, Dragon Con and other cosplay hotspots can make you think you're the only beginner, but it's not true. Have fun with it. Join the Comic-Con community. Especially if you're a first-timer, but even if you're not. You'll find SDCC attendees are a very friendly bunch and will give you all kinds of advice and helpful tips, tell you about events and opportunities you might not discover otherwise, and generally make your experience so much better. 23 weeks, friends. Let's hope that first badge sale comes soon. I have the feeling it'll be this weekend or next weekend when open registration happens. At this point I just want the uncertainty to end. Nothing from this past weekend. Looks as though open registration will be this weekend. Last year it was in February. I'm keeping my fingers crossed. But in open registration there are no guarantees. So I'm both looking forward to it and resignation. I think odds are pretty slim for us in open registration. Still, one has to try. I know everyone's freaking out. Lots of rumors, people worried about Returning Reg vanishing and Open Reg becoming the one and only Thunderdome of SDCC 2017. We'll just have to see. CCI DID say Returning Reg was happening and it would be unethical of them to cancel it now, even if they do so in the future. But at this point - we all just have to hope for the best.